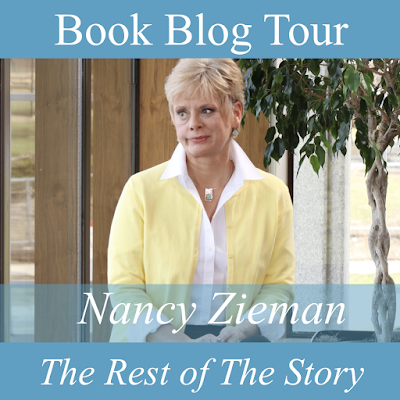 It is no secret that I was a huge fan of Nancy Zieman. 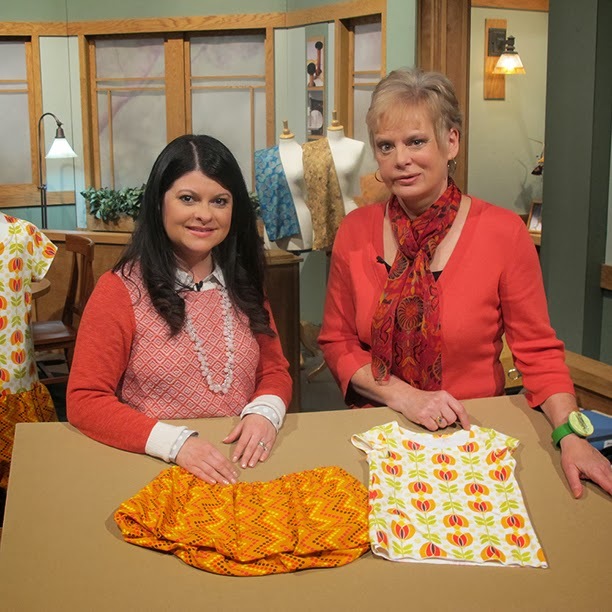 When she asked me to come on her show, Sewing With Nancy, over five years ago, I felt I had finally reached the summit of my professional career. I mean, as a designer and owner of a sewing and crafting business, what is better than appearing next to THE Nancy Zieman on national television? Then, the following year, I was asked if I would review her autobiography, Seams Unlikely, and I really thought I was dreaming. If you'd like to catch that review, it is here. Over the following few years, Nancy and I would run into each other a handful of times at industry events and it always amazed me how down to Earth and humble she was. She always greeted me by name, which I thought was incredible, given the amount of people she must've met in her life, professionally and personally. But best of all, she always seemed to have some sage advice to give, a funny anecdote to share or simply just a warm smile and a hug for everyone she met. So, as you can imagine, last Fall, when Nancy passed away, it affected me deeply. It was the end of an era... an incredible loss not just for our industry, but for friends, family and anyone who had the pleasure of meeting her. 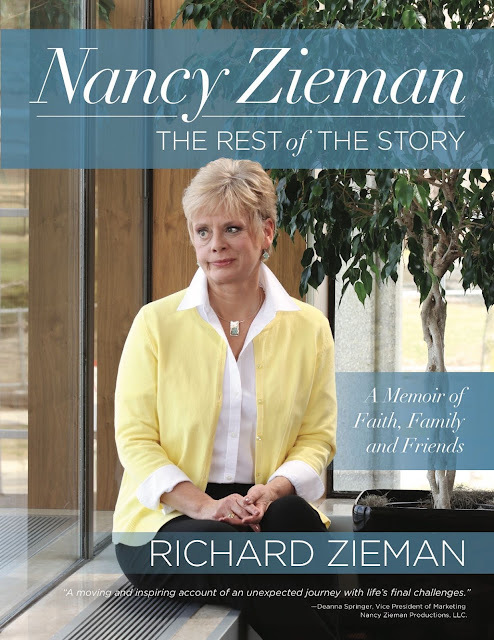 Today, I have the utmost pleasure of being a part of the book tour for Nancy Zieman – The Rest of The Story, A Memoir of Faith, Family, and Friends, written by Richard Zieman, Nancy's loving husband of 40 years. Richard begins his book with a few pages of carefully chosen excerpts from Nancy's autobiography, Seams Unlikely, which I thought was a great way to begin, not only as a refresher of the struggles and challenges she had endured, but also as the perfect backdrop from which to launch his own part of the story. His story picks up where Nancy's book leaves us. Along the way, Richard shares some behind the scenes tidbits, funny anecdotes and heartfelt personal stories, ranging from the happiest moments, like the wedding of her beloved son, Tom, to the most painful and sad ones, like her continued physical struggles, her numerous hospitalizations and her last few days. It really gives you an eye opening glimpse into the last 5 years of her life and how her unwavering faith got her through it all. 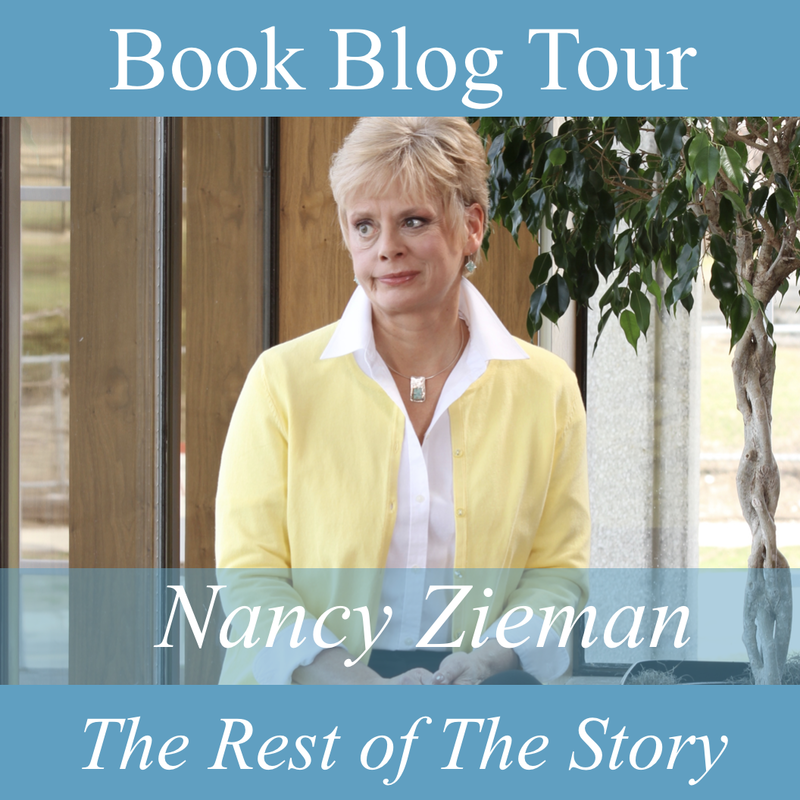 Nancy Zieman – The Rest of The Story, A Memoir of Faith, Family, and Friends officially releases on November 14th, 2018. Edited to add: The contest is now closed. The winner is comment # 5, Cheryl. Congratulations!! If you'd like to follow along with the rest of the blog tour and try your luck at snagging a copy of her book, below is the schedule. Sounds like a very inspiring book. Would love to read it. As a young mom myself in the early eighties I started watching Sewing With Nancy, on Wednesday afternoons in my area, and Nancy opened a whole new world of sewing ideas and notions to me. She made it faster and easier for me to make clothing for my children, gifts for everyone on my list and decorate my home. This Wednesday afternoon habit of mine was not to the liking of my children who wanted to watch cartoons instead, but they persevered and now my daughter and grand daughters now love to sew too. It all comes back around! Nancy, you will be missed! She truly inspired me to try many techniques that I probably wouldn't have because she & her guests made them "doable". Thanks for a chance to win. Love reading your comments about Nancy...her personality showed in her TV appearances, and made you feel like she could be your best friend!! Cheryl, you are the winner of the free book! Congratulations! Please email me at info@modkidboutique.com with your mailing address and I will send this to you ASAP. I never met Nancy but I enjoyed watching her show and learning so much from her. I have followed Nancy her entire career. What a great lady! I loved her smile and her wit. I Feel I ahah lost a good friend. She was a wonderful person and is greatly missed. I would love to read about the rest of her story. I met her at the Sewing Expo. She was gracious to take time to get our pic taken with her. A great lady! I never did watch her show, I didn't know about it. Now I feel like I missed out on something truly wonderful. Thank you. Wonderful. I can't wait to read the book. Nancy continues to be an inspiration for us. Nancy had an amazing career, and I'm sorry I never had a chance to meet her. I enjoyed her shows and how her sewing evolved. I already have so many reasons to admire Nancy Z. I'm sure this book would provide me with more, as well as a lot of inspiration. Thanks much for the chance to win a copy.